Underwater archeologist records the Emperor wreck. Some of the most interesting archeological resources in Isle Royale NP are hidden by the frigid waters of Lake Superior. The island, about 20 miles east of Minnesota and 50 miles north of Michigan’s Upper Peninsula, is close to shipping lanes from Duluth and Thunder Bay, Ontario. Isle Royale’s harbors were potential refuge during storms, but primitive navigation technology also made them treacherous. At least 10 wrecks of large ships, dating from 1870s to the 1950s, lie within the boundaries of the park. These sites comprise one of the most intact collections of shipwrecks in the National Park System. Preserved by the cold, fresh waters of Lake Superior, shipwrecks and submerged terrestrial sites offer amazing insights into Great Lakes shipping, commercial fishing, and the early settlement of Isle Royale. Investigations of shipwrecks at Isle Royale NP have provided us with a more complete picture of the connections between lake and daily life on Lake Superior during the late 19th and early 20th century. The large sunken ships found to date, all steam engine driven, span the transition from wood to metal hulls. The majority was propeller driven; only one was a side-wheel paddle steamer. Documentation and preservation of the boats helps us to better understand the technological and economic influences on shipping in the Upper Great Lakes. NPS management of Isle Royale’s shipwrecks includes identification, documentation, assessment, monitoring, and the preparation of nominations to the National Register of Historic Places. In these activities, park staff are aided by the NPS Submerged Resource Center (SRC). This specialized unit assists parks with underwater archeology projects. The staff provides expertise that may not be available at individual parks. The SRC has mapped and monitored shipwrecks around Isle Royale for more than thirty years, beginning in 1980. The wrecks are popular destinations for recreational diving, and the park monitors the sites to assess their safety and the impacts of visitors. In an informal partnership, the Great Lakes Shipwreck Preservation Society (GLSPS) assists NPS staff in preserving and monitoring one of the wrecks, America. The society repaired one of the ship’s interior walls in 1996 to maintain the integrity of the wreck and assure the safety of recreational divers. Society members have worked since then to stabilize the wreck, reattach dislodged pieces, and mitigate entrapment hazards to visiting divers. As with other national parks, active participation from an interested public is encouraged and has added tremendously to ongoing NPS management efforts. The SRC worked intensively at Isle Royale NP from 1980 to 1986, documenting shipwrecks and other underwater sites using photography, video, and drawing. 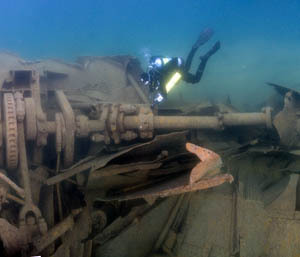 During the first three weeks of September 2009, a joint Isle Royale NP – SRC team engaged in an extensive diving project to document the condition of five shipwrecks in the park. This report summarizes NPS findings of investigations on America, Chisolm, Cumberland, Glenlyon, and Emperor. 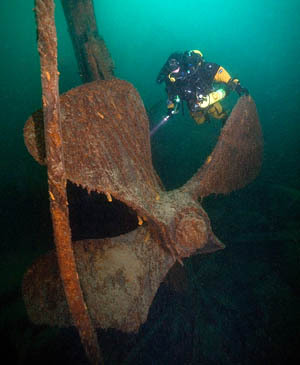 Archeologist swims near the Chisolm's propeller. Underwater archeological sites are typically more difficult to access and more hazardous than terrestrial archeological sites. At Isle Royale, notorious for its wild storms and frigid water, this is certainly the case. Nonetheless, underwater archeologists conduct the same types of research on archeological sites as their counterparts on dry land, albeit under more challenging circumstances. Visibility may be limited, water currents may move objects as they are discovered, and the archeologist has to track his or her depth and time underwater, monitor air consumption and a host of other chores that ensure safety in addition to making valid scientific observations. Furthermore, many of the tools that are used to record data on dry land are not available to underwater archeologists. GPS units, portable computers, laser surveying instruments, and other archeological tools of the 21st century are of limited utility to the underwater archeologists. Photographs and careful drawings and measurements become very important to the recordation of three dimensional shipwrecks. When excavation is necessary, silt and sediments are removed from an archeological site using a water dredge or airlift. In murky or deep waters or dangerous situations, a Remotely Operated Vehicle (ROV) can be used to document an archeological site. ROVs are unoccupied, highly maneuverable underwater robots operated by a person aboard a surface ship. An ROV is linked to a ship by a tether that carries power and data between the operator’s control console and the vehicle. Most are equipped with at least a video camera and lights. The SRC used an ROV to document the current condition of the America in September 2009, and consulted with representatives of the GLSPS during the assessment. The ROV enabled SRC staff to examine and discuss submerged shipwreck sites while staying on the surface. The work at Isle Royale NP helped to refine SRC staff’s approach to mapping and interpreting large shipwreck sites. The use of low technology-high diving intensity procedures evolved here, including baseline mapping with trilateration. This methodology has become a standard approach of NPS diving teams. The photographs, maps, notes, and other field records that are created by the investigations can contain unique and important data about ships at the time of sinking. Shipyards may have kept incomplete drawings of the ships that they built and ships were typically modified numerous times during the period of their use as commercial conditions and the needs of their owners changed. Available drawings may be only of the hull, excluding the superstructures and the engines, and modifications to the ship may be poorly recorded, if at all. On Lake Superior, as immigration to western ports dropped, passenger ships were converted to haul cargo. Archeological investigations of shipwrecks document changes made to boats subsequent to building and form an important material counterpoint to the documentary sources typically used for histories of shipping and maritime commerce. Archeological evidence and oral histories indicate that Native Americans visited Isle Royale, probably on a seasonal basis, to fish the surrounding waters and to mine copper. Over 37 Native American sites have been identified on the island. Euroamerican history of the island begins with fur traders and trappers; the island was known to Europeans by 1658. Fur trapping and trading were significant economic activities in the Lake Superior region for about 200 years between the mid 1600s and the mid 1800s. The small land mass was soon trapped out, however, and there were no advantages to establishing a permanent trading post on an island so close to the mainland. The waters around Isle Royale supported several large species of fish including lake trout, white fish, and sturgeon. The American Fur Company established a fishery on Isle Royale between 1835 and 1837. Fur company managers wanted to trade fish to farmers in Ohio in exchange for corn, cheese, lard, and other provisions. The Isle Royale fishery was the most productive of the fisheries, sending 2,000 barrels annually south. After the American Fur Company moved their operations to the west coast of the U.S. and closed the Isle Royale fishery, independent fishermen continued to fish the waters around the island. Lake Superior experienced a boom in fishing in the 1880s and thousands of barrels of fish were sent each year to markets in major cities. Fish were salted, packed in barrels, and picked up from stations, first by schooner and later by steamship. The oil from siskowit (a type of herring) was rendered and sold for use as a paint base. Fishing in Lake Superior declined in the 1920s; in 1937 there were 45 families on the island that relied on commercial fishing. Commercial lumbering in the Upper Great Lakes began in the 1840s and 1850s. Lumbering on the island was not very productive, but the island saw great booms of logs being towed by steambarges carrying milled lumber. The lumbering industry provided incentive for transforming outdated passenger and side paddle boats into barges. Tourism as a commercial enterprise began on Isle Royale in the 1890s. Five passenger ferries ran on a regular summer schedule from communities around Lake Superior to the Singer Hotel. One of these ferries was America, that sank in 1928. Isle Royale became a national park in 1937. A diver explores the Glenlyon wreck site. Before other forms of transportation, sail boats and, later, steam ships linked settlements on the shores of Lake Superior with Chicago, Detroit, Cleveland, Buffalo, Toronto, and Montreal. Northern cities such as Duluth, Thunder Bay, and Marquette prospered as depots for goods and people. The shipwrecks around Isle Royale bear testimony to the importance of water transportation in settlement and commerce in the Upper Great Lakes. While we see lakes and other bodies of water as barriers, in the centuries before railways and roads the Great Lakes connected communities and commerce quickly, relatively reliably, and with great socio-economic intensity within a relatively constrained geographical area. Passenger service was an important aspect of shipping on the Great Lakes. Regular passenger service was established on Lake Erie in 1830, and by 1832, over 60,000 immigrants had moved into the Great Lakes region (Lenihan 1987:16). By 1850, immigration had risen to 369,000 annually. Lake Superior saw the first passenger steam ships in 1845. Resource extraction was a prime motivating factor in opening the Great Lakes. Once immigrants established farms, businesses, logging companies, and mines, transportation was needed to take freight to market. “The economic potential of rich farmlands and mineral deposits of the Midwest could not be fully realized until it was possible to transport the products to market” (Lenihan 1987:16). The first freight steam ship on the Great Lakes was in 1843. Transportation on the Great Lakes is at least as dangerous as on the oceans. In the relatively narrow confines of the Great Lakes, storm generated wave heights coupled with a short period between waves places greater stress on ships’ hulls, and there is less sea room for riding out storms. Heavy fogs and ice can also threaten the safety of ships. Weather conditions contributed to the fate of many of the vessels around Isle Royale. The earliest boats on the Great Lakes were sailing boats built on the shores of the lakes, as Niagara Falls was a barrier to boats coming up the St. Lawrence River from the Atlantic Ocean. After the Erie Canal opened in 1825, and the Soo Locks in Sault Saint Marie opened in 1855, ocean going boats could enter the Great Lakes, but were restricted in size by canal dimensions. A “canaller,” a boat that accommodated the limitations of the canals, was the first distinctly Great Lakes vessel type (Lenihan 1987:29). The development of steam engines changed almost every aspect of shipping and transportation on the upper Great Lakes. The forces that steam engines harnessed dwarfed wind power. Steam ships could move cargos of tremendous size against the wind. By the end of the 19th century, more tonnage was being moved by more ships per square mile of water in the Great Lakes than all the rest of the U.S. combined (Lenihan 1987: 15). Great Lakes ships could load, unload, and move a ton of cargo a mile for less cost than any other place in the world. This ability to move bulk freight at a lower cost than railroads enabled Great Lakes shipping to flourish after the canal trade in the Northeast had collapsed. Steam ships cost several times as much as sailing ships to build and to operate. Propulsion machinery was expensive. Engines and boilers were sometimes used in three or more ships before being discarded, and ship owners endeavored to salvage engines from wrecks. They burned 2-3 cords of wood per hour and required larger crews than sailing vessels. While a sailboat’s maximum crew size was about 12, steam ships required up to 40 people to run. There were limits to the size of wooden steamships, however. The longest ships (such as Chisholm) were no more than 300 feet. After that they exceeded the structural properties of the wood they were made of and shipbuilders found they could not build commercially viable ships that were larger than this. While the earliest steam engines on the Great Lakes were side-paddles, propeller, or “screws,” soon replaced them. Propeller boats burned a quarter of the fuel that side-paddle boats did, and the machinery was cheaper to build and less expensive to maintain. The propeller steamship allowed the development of both parts of the ‘consort system.’ The consort system, developed in the Great Lakes, consisted of a barge and a steamship (‘steambarge’) to pull the barge. The efficient little towboats that appeared soon after the development of propeller boats expanded in size until they carried freight while towing barges. The barges were frequently retired side-wheel paddle steamers or, after the major wave of immigration in the 1850s, passenger boats stripped of their accommodations. The barges carried bulk cargo such as lumber, ore, and grain. The consort system revolutionized the movement of bulk cargo throughout the Great Lakes region. The first bulk freighter was RJ Hackett, a steam ship built specifically for transport of ore and grain was built in 1869 (Lenihan 1987: 32). It was doubled decked with wide hatches spaced to match the loading chutes on the docks in Marquette. Iron and steel ships were first built in England and Scotland in the late 18th century. The first iron-hulled ships on the Great Lakes were built for the Federal government in 1843. Iron had a higher ratio of strength to weight than wood, and more longitudinal strength. As a result, iron ships could be built longer than wooden ones. Iron ships were cheaper to build and repairs were simpler. They also lasted longer, often over 100 years (Lenihan 1987:35). After a ready source of iron was found and ore shipped cheaply from the Upper Peninsula of Michigan, iron ships replaced wooden ones on the Great Lakes. Wood was largely abandoned by 1900. One of the most striking things about steamship history on the Great Lakes is the speed and power of the ships combined with limited steering capacities and a primitive navigational system. It was not unusual for individual boats to run aground more than once in a shipping season, sometimes with no effect, sometimes with significant damage. Nine of the ten major shipwrecks around Isle Royale occurred as a result of grounding; three (America, Cox and Emperor) went aground in good weather. Wrecks of large ships around Isle Royale can be found in 3-270’ of water. While some ships are relatively intact, others such as Glenlyon are smeared over thousands of feet of lake bottom, dispersed by storms and ice in the decades since their loss. America operated for 30 years transporting people and goods before it struck a reef outside Washington Harbor on Isle Royale, on June 6, 1928. The wreck lies against a steep underwater cliff and reaches a maximum depth of 85 feet. The Henry Chisolm was a wooden bulk freighter that was built in 1880 and ran aground in the predawn hours of October 20, 1898. Large sections of the wooden hull lie scattered among the remains of another wreck, Cumberland, which hit Rock of Ages Reef on July 25, 1877. The reef is now marked by the Rock of Ages Lighthouse. 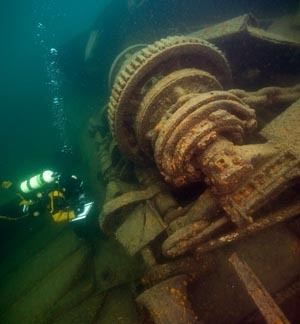 This site features an intact steam engine with drive shaft and propeller sitting in about 140 feet of water. The double expansion steam engine stands about 20 feet tall and, in near perfect condition, is framed in ornate iron work. The engine has two pistons, one 30 inches and the other 56 inches in diameter that operated with a four foot stroke. Cumberland is the only side-wheel steam ship examined in 2009. It was built in 1871 in Port Robinson Ontario, and went down on the Rock of Ages Reef on July 25, 1877. It broke in two on August 18. Because it was built of wood and lies in relatively shallow water, the remains of the Cumberland are more fragmentary than many of the other wrecks in the park. Glenlyon was a 328-foot bulk freighter, built in 1893. It ran aground in the early morning hours of November 1, 1924 while seeking shelter in the Siskwit Bay from fall storms. The wreckage consists of a windlass located on the intact bow of the ship and many sections of the metal hull scattered across the bottom for a distance of 900 feet with the stern section and machinery on the seaward side of the shoal ridge. The formation of the site graphically demonstrates the natural forces affecting Lake Superior shipwrecks. During the current investigations, the team discovered that a large boiler mapped by the SRC in the 1980s moved from a ridge above the reef where it originally came to rest to the inside of the ridge near where the intact bow section lies. This boiler moved approximately 80 feet to its present location, likely a result of ice floes over the site. Ice can create a dynamic environment which moves pieces of shipwrecks long after they have come to rest on the bottom. Despite the disarticulation of the remains, most elements of the wreck are easily identified because they are not far removed from their structural location in the vessel. Emperor was a 525-foot steel bulk freighter built in Canada in 1907. The vessel met its demise in the early morning darkness of June, 1947 while carrying a load of iron ore. Principal blame was placed with the First Mate for not keeping "proper watch." This was later modified when investigators discovered that the prevailing system required him to be in charge of loading when he should have been off-duty. The investigation concluded that he was overtired from lack of sleep. Out of this accident came the practice of today's Great Lakes’ sailors, who work on a four-hours-on, eight-hours-off schedule. The upper Great Lakes were opened for Euroamerican settlement by, first, sailing vessels and, later, steam ships. Boats carried settlers to Lake Superior and later carried goods and natural resources to market. By the end of the 19th century, metal-hulled steam ships carried grain, iron ore, lumber, and fish to markets. The relatively small sizes of the Great Lakes, in relation to oceans, and narrow passages between lakes enabled sailors to spend more time on shore and stop at ports more frequently. The sailing schedule enabled sailors to maintain social ties and facilitated communication. Great Lakes sailors were integrated into communities in ways that their ocean-going counterparts were not. Today, shipwrecks around Isle Royale are testaments to the vigorous shipping industry that transported goods and people between urban and rural areas. Relatives and descendents of people who worked on Great Lakes boats are proud of this heritage. NPS staff at Isle Royale NP document and preserve the material remains of this chapter of American history for communities associated with the Great Lakes shipping industry and for all Americans. Learn more about Isle Royale NP. 1994 Shipwrecks of Isle Royale National Park. Lake Superior Port Cities, Inc., Duluth, MN.